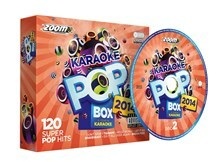 Zoom Karaoke CDG Pop Box 2014 - The UK's best-selling karaoke cdg pop box. It has 120 of the best 2013 tracks, all with real instruments and no fade out endings. Disc plays on a regular CD player (no lyrics displayed), but will display on screen lyrics when used with a compatible cdg player.